Spirulina is a type of sea vegetable, a microscopic saltwater plant harvested for its health benefits and sold dried as a health supplement in powder or tablet form. Rich in vitamins and protein, spirulina powder contains less filler than tablets do and can be added to smoothies, juices and other foods. In turn, tablets are more conveniently stored and transported than powder is. Some tablets are now designed to break down quickly for easy digestion. However, in general, powders are more reliable for absorption than tablets, as in some cases the tablets may not fully disintegrate, leading to fewer absorbed nutrients. To ensure the tablets disintegrate easily, manufacturers often add extra chemicals. Many tablets are also coated so they are easier to swallow. While some spirulina producers make tablets without fillers, many tablets contain binders that hold the spirulina powder together. Silicon dioxide, a type of clay, is commonly used to bind tablet ingredients, and because of the need for binders, spirulina tablets may contain upward of 20 to 30 percent binder in a single tablet. This means that you will need to consume more tablets to achieve the same dosage as pure spirulina powder. 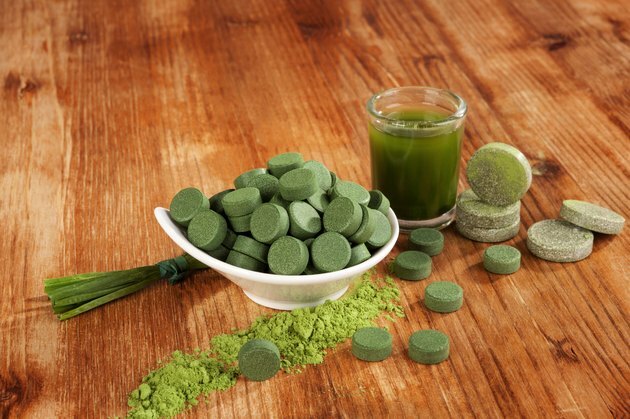 Tablets and powders for spirulina are both cost-effective, but tablets are more shelf-stable. You can easily mix spirulina powder into smoothies, juices or even soups and baked goods, but it can be very inconvenient if you need to consume spirulina outside of your home. If you do decide to use spirulina powder rather than tablets, you can always make your own spirulina capsules -- purchase the capsules at a health food store -- which makes it easier for you to keep a supply in your purse, glove box or at work in your desk to take as needed. Spirulina powder is easily mixed into foods, and you can also crush tablets into a fine powder and add it directly to drinks and dishes. However, this is time- consuming and may still lead to small chunks of unbroken tablet. In addition to mixing spirulina powder in with juices or smoothies -- use a blender to ensure few clumps -- you can also add it to dips, salads and pasta sauces. Mix 2 teaspoons of spirulina powder into your pesto sauce to give a nutritional boost to your meal, sprinkle the powder over a salad, or mix it in with a sour cream dip, salsa or guacamole.